The Patriots welcome the Buffalo Bills to Gillette Stadium for their Week 17 matchup. 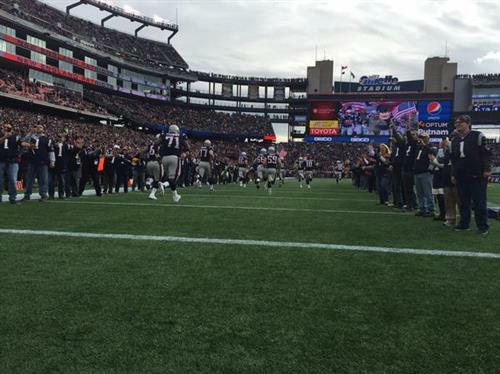 Follow along here for live updates of the game, including commentary and analysis from Boston and Foxborough. hasn't missed a game since 09 opener RT @Megastarrr3: why isn't Brady inactive..? Brady putting on his helmet. He looks ready to go in. #Bills call tails, coin comes up heads. #Patriots elect to defer. Bills will have the ball first. Bills call tails. Coin flip comes up heads. Patriots win the toss, elect to defer. Bills will get the ball to start. Copy and paste. #Patriots win the toss, elect to defer. Logan Ryan starts for Brandon Browner. Among the Patriots defensive starters: Wilfork, Ninkovich, Revis, Chandler Jones. Logan Ryan started in place of Brandon Browner. Jonathan Casillas in place of Hightower. Bills go 80 yards in 6 plays. Easy TD drive. Robert Woods catches a 10-yard TD as the Bills take a 7-0 lead 3:01 into the first quarter. Jeez, you guys, I don't know if the Patriots backups are as good as the starters. Bills hit the easy button. Six plays, 80 yards, touchdown. Brady in for the first series. End of the first quarter, Bills lead the Patriots 7-3. One quarter in the books at Gillette. Brady, Wilfork, Revis have played the entirety so far. Bills lead Patriots, 7-3. Heads I watch the rest of the game, tails I record it and go back to sleep. Hmmm, tails but I elect to defer. #Patriots defense in preseason form right now, in more ways than one. 1-yard touchdown run for Boobie Dixon and the Bills jump ahead of the Patriots 14-3. Aside from a lackluster offense, a suddenly-porous run defense, and a total lack of intensity, I like what I'm seeing from the Pats! Interesting goal line defense. That front looked like it was 1st and 10 from the 20. If defense isnt going to play, why not put in more subs? Bills score again, go 80 yards in 13 plays. It's quiet here at Gillette. #boredom? Brady back out for another drive.